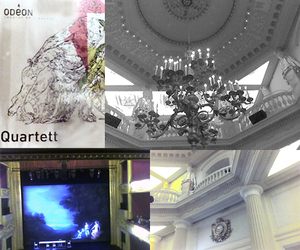 My first Paris play: Isabelle Huppert in “Quartett”, directed by Robert Wilson at the Odeon Theatre. My friend Olivier generously invited me to the theater last night and what a stellar introduction it was with a performance by one of France’s greatest actresses at the most prestigious theater in Paris. Officially titled the Odeon- Theatre of Europe, it was built in 1827 and was the first theater in France to present Shakespeare in English and introduced French audiences to Ibsen, Tolstoy, Turgenev, and Stindberg. Its mission is “to foster joint work and projects by stage directors, actors, and writers for the purpose of presenting new original works and bringing life to the artistic heritage of Europe “. The theater, recently reopened after extensive renovations, is a beautiful formidable structure with creamy white columns outside, gorgeous sculptures and chandeliers in the lobby, and the theater itself a marvel of gold gilt and velvet. Thanks to Olivier’s connections, we had perfect seats in a luxurious private box with red velvet chairs. 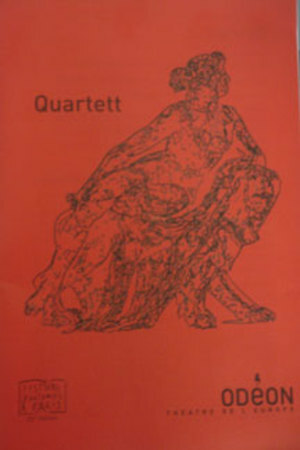 Quartett is based on Les Liasons Dangereuses, a story I was familiar with, Thank god, so it made it easier for me to understand even when the French was flying out of the actors mouths at 100 mph. Isabelle Huppert as Merteuil, so deliciously played by Glenn Close in the 1988 film, was radiant in a deep purple one-shoulder column gown. I was enthralled by her performance and was pleasantly surprised by her strong stage presence, since I’ve seen many great film actors fall flat when they are on stage. The production was vintage Robert Wilson with stunning lighting, minimal sets, hypnotic movement, and innovative use of sound. The end scene with Isabelle Huppert lying still on the floor on a dark stage while the back wall slowly unfolded into a white screen, was spellbinding. Afterwards, we went to dinner nearby at Cremerie Restaurant Polidor, a wonderful old brasserie with tile floors, dark wood walls and long communal tables serving classic no-nonsense French food. I enjoyed pumpkin soup, beef bourguignon, and home baked lemon tart for only 20 Euros. Thrilled by the play and satisfied by my hearty dinner, my passion for theater and food was well taken care of. That restau seems like a good deal. I'll check it out next time I visit Paris.